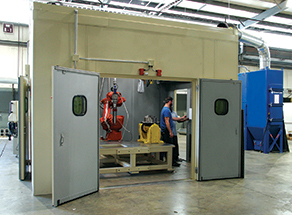 Alabama Laser specializes in the design, development, and manufacturing of custom laser systems for unique laser processing solutions. These custom laser systems utilize a diversity of laser beam delivery components manufactured by Alabama Laser and can be supplied with the customer's selection of resonators, depending on the wavelength, power, mode, and modulation (pulsed or continuous) required. This custom laser system incorporates a robotic pick-and-place system for proper positioning of parts and two welding heads to perform separate laser welding operations in one station. This custom laser welding system incorporates a conveyor system, several built-in inspection stations to verify part accuracy, and two welding heads to perform separate welding operations. This custom laser system performs welding operations using six welding heads simultaneously to increase productivity. A hybrid welding system which utilizes the welding capabilities of a 10,000 Watt fiber laser and a MIG welder. This custom laser etching system reads a bar code on a component to identify its series then etches the appropriate series number onto the component.